TEHRAN – Syrian President Bashar Assad has said that it is not possible to establish peace and security in the Middle East without Iran’s contribution. "Iran is a very important country in the region and Damascus never wants to lose this ally," Assad said in an interview with the Austrian newspaper Die Presse published on Wednesday. Syria is determined to have friendly relations with Iran and the West will not succeed in its efforts to foment discord between the two countries, said the president. He added, "The U.S. is seeking to isolate Syria because it had opposed a military strike against Iraq, but it would not be able to isolate us under the pretext that we are having good relations with the Islamic Republic." Asked about the reason for Syria’s support of Hamas and Hezbollah, the president said, "Hamas is a powerful movement in Palestine. Without Hamas peace and security will not be established in the country. This is also true about Hezbollah in Lebanon." "Syria cannot trust Israel as long as it is pursuing its acts of aggression. As long as a part of our land is under Israel’s occupation we will not recognize this regime," Assad said, referring to the Syrian Golan Heights seized by the Zionist regime in 1967. He also condemned the U.S. intervention in Lebanon’s internal conflicts over electing a president, saying that Damascus is making every effort to help Lebanese political parties agree on a consensus president and also form a national unity government. Syrian President Bashar al-Assad says that Damascus will not allow the US to marginalize his country over its alliance with Tehran. It is not possible to stabilize the Middle East without Iran's cooperation, al-Assad said in an interview with the Austrian paper Die Presse. 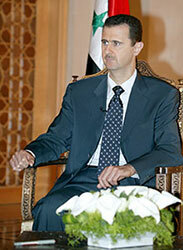 The Syrian president added that Western countries devise strategies to strain the good relations between the two states. The US also makes efforts to isolate Syria over the country's objection to the Iraq war, Bashar al-Assad added. Regarding Syria's support for Hamas and Hezbollah, the president said that peace and stability cannot be established in Palestine without Hamas as it is a powerful movement, just as Hezbollah is in Lebanon. The Syrian President says reaching a peace agreement in the Middle East in 2008 is unlikely due to the upcoming US presidential election. It is perhaps too late to talk about peace in the last year of this US administration. 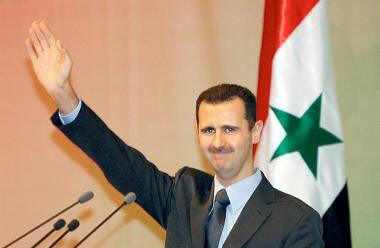 It will be preoccupied with elections,' President Bashar al-Assad said in an interview with Die Presse on Wednesday. Damascus attended a US-sponsored Middle East summit held in Annapolis last month. The summit was organized to re-launched formal talks between Zionist officials and the Palestinian Authority to reach a peace accord by the end of 2008. "Syria always speaks of the just and comprehensive peace: the comprehensive peace which includes all tracks. This conference is to deal with the Palestinian track; this is good and we will be happy that there is a conference for the Palestinians; but what is our role? We were to go when the objective and the basic is to be the just and comprehensive peace; that is to include the cause of the Golan. We can not only talk about the Palestinian track. The Syrian track is a basic one; and the cause of the Golan is second to none." " The war of October does not only represent for us now in this phase a military issue with its military meaning. There are also those issues of Arab Solidarity; where this War has indeed demonstrated the Arab Solidarity from the ocean to the gulf. The other side of this war is the issue of the will , where we ,during many of the living moments, fell the feelings of frustration by the Arab Citizen and perhaps by the Arab Official. The War of October has expressed the how and the possibility of changing frustration which existed between the defeat of the 1967 and the War of 1973. Now what we can do is how to restore the Arab Solidarity, how to alleviate or eliminate frustration as to move forward into a phase of active work, from succumbing to the de fact into the alternating of the de facto." " Israel shrouds its failure with ambiguity; what they have targeted in their attack was but unimportant : an empty military edifice under construction. This is an intelligence failure whether the source was the Israeli Intelligence or the US Intelligence. Israeli officials have been embarrassed as to declare the target of the attack; they have covered this failure with ambiguity saying that it was a secret! They did cover their failure with ambiguity…. The said attack expresses the Israeli non-desire for peace and , as you say, a bid to blackmail Syria. It is, however, not the first attack of its kind; they have attacked the Syrian troops twice in Lebanon before 2005, have violated the Syrian airspace twice before this attack. In every attack, they were to believe that Syria has understood the message! The result for us is that we have our principles, and rights which we will never surrender as a result for all the previous pressures." " There is a Turkish mediation since my visit to Turkey in 2004. We have made it clear to the Turks that our position regarding peace has never been changed. We want first of all a clear announcement by the Israeli officials about their desire for peace , the restitution of the land to Syria, and secondly, guarantees that the land is to be restored in full. A mediator can convey the parties viewpoints, but the negotiations need a sponsor with a specific position at the international level. Unfortunately, in this case it is the USA as the only real sponsor in this case." " Trust is missing between us and the Israelis. This trust today, even if it a little bit existed previously, is frankly null. We trust the Turks , there is a reciprocal trust to a big extent between us; and we told the Turks that once we were to receive the said guarantees, we can by then say that the climate is prepared for peace. Then, we can talk with other forces, and especially with the USA, as to resume the negotiations. However, we are quite certain that this US Administration has never worked for peace." 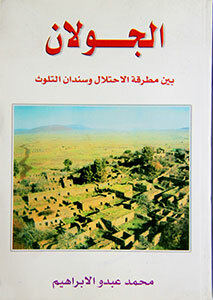 " The Arab-Israeli conflict is a 60 year old one, has never been started by personal differences as to be concluded with personal-related matters statements; there are the basics and principles; and once the Israelis respond to these basics and principles , and the destiny of these rights, we can by then evaluate the Israeli stance. Every thing we have so far heard is but an oratory speech-tailored words away from the reality on the ground!" " we are not certain of the conference seriousness; this seriousness is linked to the conference Terms of Reference: the basics upon which to be based; whether upon the mood of those who called for the conference! Or to be based upon certain basics like the resolutions of the International Legitimacy: on top of which are 242 and 338 Resolutions and other resolutions. Syria always speaks of the just and comprehensive peace: the comprehensive peace which includes all tracks. This conference is to deal with the Palestinian track; this is good and we will be happy that there is a conference for the Palestinians; but what is our role? We were to go when the objective and the basic is to be the just and comprehensive peace; that is to include the cause of the Golan. We can not only talk about the Palestinian track. 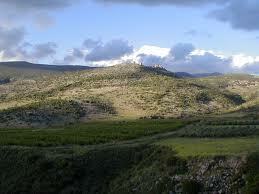 The Syrian track is a basic one; and the cause of the Golan is second to none. This Cause is not presented. There is another thing related to seriousness: Were the concerned countries of the Arab Israeli conflict consulted? However, we have not yet received an invitation to attend the said conference; if we were to receive an invitation, these are the conditions of Syria as to attend the international conference." " The opportunities for peace now do not exist in reality; for example, at the Palestinian level, there is a division. Peace needs national consensus first of all, which is not available. The US Administration lacks both the vision and the will for peace, Israel lacks at least the will; I do not know whether the vision exists or not; but the Israeli government is weak. A weak government can launch a war, but can never realize peace…. Unfortunately, the current Israeli government is unable to provide any guarantee for peace and the return of the rights…. Perhaps the issue of normalization stands behind the conference aim, or the issue of diverting the US public opinion or the western opinion from the issue of Iraq, where failure has been clear. They have been trying in vain to deal with the consequences of the failure in Iraq. Consequently, perhaps they have decided as to go for the peace process with the aim of realizing something, even illusive to present to the public opinion." " Lebanon was stable in the stage which followed the Taif Accord,- September 1989- when it adopted the Arab stance and the support for the resistance, that is when it was against Israel. When Lebanon gets out from this logic, and any Arab country which does so, becomes unstable. We can never establish the future of the Syrian-Lebanese relations with forces which never believe in Lebanon: with any trend becoming closer to Israel conditioning its decision to foreign powers. We , as ever have been, are the more keen on stability in Lebanon, and on the normal relation with Lebanon, as a part of the natural historic relations between both people." 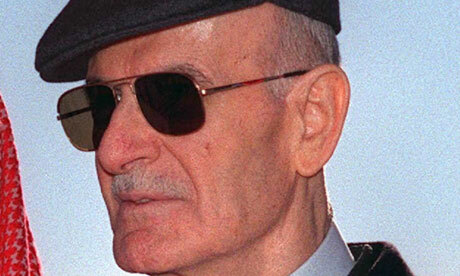 " The Lebanese Resistance is far more powerful today and especially from a popular aspect. I am not talking about the military aspect, the popular. The power of the Resistance stems from its popular support, which is more inside and outside Lebanon, as we witnessed last year during the Israeli aggression of July against Lebanon…. The Arab people in general support every resistance. Syria’s position stems from the position of the Syrian Arab People. Our support for the Resistance is a political one linked to our causes. The Resistance in Iraq has its finance and weapons; they have every thing, and need no military support from any side, neither from Syria, Iran, nor from others." " The unity of Iraq is still a big hope possible to be realized. At the same time, we have to talk of a political process. First, The solution in Iraq must be based on the Arab Identity of Iraq, the Arab Iraq. Second, the assistance as to help in solving the Iraqi crisis should be an Arab one in essence before being a foreign one; the Arab countries should have a basic role. Third, the internal political process in Iraq should include all forces away from the US definitions…. Unfortunately, the Arab role is missing ; two years ago, there was a dialogue between us and several Arab countries concerned directly as to make an Arab initiative; we , however, have not found any response to this effort. Actually the role now is merely a Syrian one ; of course, there is a cooperation with the concerned countries, basically with Turkey and Iran as to preserve the unity of Iraq evading a destructive sedition, and to support at the same time the political process…. I think the current US Administration does not want from the countries neighbouring Iraq to help Iraq. We have told the Iraqi officials that the more they are independent, the more Syria is to provide them support; I think that this pertains also to the neighbouring countries of Iraq…. They- the Americans, have announced the so-called ‘ creative chaos’ ; we, Arabs, ourselves have not announced this. Consequently, we can say that what is happening is part of a scheme. Second, there are US writings and researches presented during the 1980th regarding the dismemberment of the region starting with Iraq . We judge things by realities, not by intentions; if their intention were to be good, and have destroyed Iraq and the region; can we speak of their intention as good! The issue is not that of a slap in the face , it is the issue of destroying the region which has millions of people. We can never judge intentions in such a case. The result is the destruction, division, sabotage and sedition." " So far we have received but the promises, nothing concrete ever. We fully shoulder all the burdens. Recently, I have heard a statement from the Iraqi premier that he was to provide small amounts : 18 million US Dollar to Syria, I think 12 million Dollar to Jordan and perhaps to other countries. 18 million US Dollar for who shelters hundreds of thousands are nothing. We provide of Fuel support only about a billion US Dollar for a million and a half of the Iraqis in Syria…. The Iraqi citizen now shares the Syrian citizen all the services. The sheltering of the Iraqi citizen in Syria , notwithstanding the economic burdens, provides Iraq a positive value as to enable the Iraqi citizen to live. We believe that our hosting of the Iraqi citizen is political before being an economic one." " The US may take a fool action, if we were to think logically. Such an action is to be harmful for the region and the world. We have to remain ever alert for any reckless action by the US, or by Israel against Iran , Syria, Lebanon, or against any other state….The problem for the world will be far more bigger than that of the Iraqi invasion considering the strategic position of Iran and its power. The situation would be very difficult for the US, its consequences would cover all the world in general. If the war were to begin, how is it to conclude; nobody knows! But we will be the first to pay the price: the Arab countries, especially the Arab Gulf region which is to pay a very high price for such an action…. We are all targeted, no country in the Arab World is not to be the price for the explosion to happen." " The Arab situation is still unsatisfactory and calls for concern. What is important is not what we talk about; but what we implement; not the Arab Summits, but the implementation. When it comes to the implementation, we are divided, at times if not divided, but careless for each other….Syria’s interest is to have Arab Solidarity existent at whatever extents. The Arab-Arab relations are good at the highest levels, but at other governmental or in the countries in general do not exist; or there is no follow up. The high level relation is not suffice to create good relations between two countries; there are establishments ; it is not only a personal relationship, a good personal relation can be reflected positively on relations between two countries in general…. If we were to compare the relation of any Arab country with Europe, or perhaps with Asia, we would see that it is far more better than the Arab-Arab relation… A kind of hope and optimism has to remain however." " Firstly, We have our priorities which are based on the most dire needs of the Syrian citizen. Secondly, it- the process of Reform and Modernization- depends on the possibility of achieving progress in a track before another track. 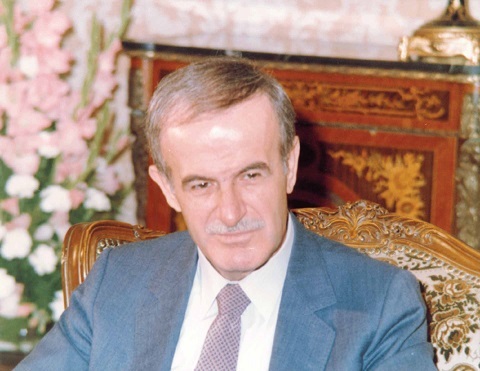 The first priority was the economic one as to improve the citizens living standards; the second priority is the political one related to elections laws, especially local administration and parliamentarian elections and to political parties….We have initiated this process; with my election to the presidency, the Intifada started in the occupied Palestine, pressures on Syria, because of its support to the Intifada, started. The 11th of September took place with that Arabs have had to pay as the price; the Arab weakness has started in reality after this stage and not lately; and the invasion of Iraq took place. From here direct pressures with an excessive amount against Syria came. The consequences of the occupation resulted with an increase of extremism and the start of terrorist acts, which disappeared from Syria for decades and began to take place after the invasion of Iraq. Thus, the priority for us has become also to preserve the stability in Syria, as the first priority, where the economic priority has become the second, and the political one the third…. How can we build a good economy without stability? We, however, have made economic strides: the growth rate was in 2000 less than 1 percent and became 6,1 last year notwithstanding though of the political circumstances." "If we help the chaos in Iraq, this means we work against our interest. So we do our best to control our borders, first of all for the Syrians; second, for the Iraqis; third, for the region." President Assad: What do they do, those terrorists in Iraq? They kill civilians, they create chaos. What interest have Syria in having chaos in Iraq? Chaos is contagious. If we help the chaos in Iraq, this means we work against our interest. So we do our best to control our borders, first of all for the Syrians; second, for the Iraqis; third, for the region. Couric: You say that chaos does not work to Syria's advantage. Does that mean you support a stable, democratic Iraq? President Assad: Definitely. For our interest, first of all, and for Iraqi interest, second. Otherwise the whole region, and maybe later, indirectly, the rest of the world will be suffering. But we will pay the price first, and we are paying the price for the chaos in Iraq today. So why not to work if it's in our interest? This is definitely and this is the announced position of the Syrian politics. Couric: So you support the U.S. efforts to help establish a democracy in Iraq? President Assad: If they do ... but they don't do. They don't do it. There's no effort. They only talk about military - numbers of soldiers, raising up the number or making it go down. There is no serious political process supported by the Americans so far. Couric: But I was in Iraq and in Anbar province. President Bush and his other top officials were meeting with Prime Minister Maliki and his top leaders, trying to move democracy forward. Why do you say there is no political process going on? President Assad: We¹re talking about the results. It's getting worse every day, nothing is better. Sometimes it gets better, but it's like a flash in the pan; it just disappears, it's transient. We're talking about the result; the chaos is worse, the killing is worse than before. Couric: Let me ask you about the Damascus airport. It is considered a major point of entry for terrorists going into Iraq, and you have been highly criticized, Mr. President, for not taking greater action to stop that from happening. Why haven't you? Why haven't you got in control of your airport? President Assad: It's not an airport problem. It's not related to the airport. This is again another false allegation. They've been harping on this bogus claim for four years. But actually the terrorists, if they want to come, they don't have to come to the airport. They can cross any border, anyhow, by any means, to go to Iraq. Couric: You're telling me you have no evidence and no knowledge that terrorists are using Damascus International Airport as an entry point and then going to Iraq? President Assad: No, I didn't say that. I said, if I want to continue or elaborate, we caught many coming from the airport, but mainly most of them they don't come through the airport. They came through the illegal borders and we caught them. Couric Let's look forward. Do you believe that U.S. troops should withdraw from Iraq? President Assad: Definitely, yes. As a principle. How and when, this is an Iraqi issue. We cannot decide it as Syria. Couric: Are you concerned though, Mr. President, that if U.S. troops do withdraw, and do it too precipitously, the country will break out in an all-out civil war? President Assad: Yes. We have to take the context of the events since the war, after four years ... every day is getting worse than before. So I cannot say that American forces will bring stability to Iraq. This is for sure. Some say if they leave, it will get worse, maybe. So this is not a debate. As principle they have to leave. Couric: Do you want to see America succeed in Iraq? President Assad: My priority now is the stability in Iraq. It doesn't matter if the United States leaves today or tomorrow. My priority is the Iraqi people and my country. And of course, if the success means political stability, we don't have any problem because we support any country in the world, including the United States, in succeeding in Iraq in that regard. Couric: Mr. P, thank you very much for your time. President Assad: Thank you for coming. © MMVII, CBS Interactive Inc. All Rights Reserved. Mother Jones speaks with Syria's president about terrorism, Syria's role in the Middle East, and the future of Iraq. Ehrlich began the interview by asking Assad if he thought the Bush administration was actively planning to overthrow Syria’s government. Bashar al-Assad: These are rumors. Rumors. I can only talk about facts. But the most important thing, whoever thinks about destabilizing Syria, he should know that he is going to destabilize the region. We are the safety valve in the region. Mother Jones: The safety valve? BASHAR AL-ASSAD: The safety valve in the region. BASHAR AL-ASSAD: In a very political way. Very political way. The real, the history of Syria, the role of the Syria and the region, the link between Syria and our neighbors, social links, ideological links, and interest links with the region. So the whole region is connected with each other. MJ: You mentioned that in the past Syria has helped provide intelligence about terrorist groups, Al Qaeda and so on. Explain that, and when did that cooperation end? BASHAR AL-ASSAD: Actually, we started cooperating with the United States. We took the initiative to cooperate with the United States intelligence after the 11th of September. And we succeeded in preventing more than seven plots made by Al Qaeda against the United States. The cooperation stopped last March, in 2005, because of mistakes were made by the United States, first. Second, because of their political position was against Syria. 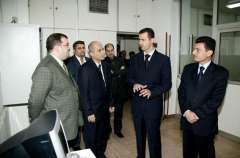 Feb. 5, 2007 — - Syrian President Bashar al-Assad, a 41-year-old doctor, is the son of the legendary Syrian leader Hafez al-Assad, who negotiated with five American presidents. Many in diplomatic circles believe that this quiet man may be the best hope for the United States to broker peace with insurgents in the Middle East. In a significant moment, Assad told ABC News' Diane Sawyer that he was ready to talk to the United States, but that it must be in public -- and that because the situation was so dire, the time to talk was now. So far, the administration has refused to engage in talks with Syria. Below is the transcript of Sawyer's exclusive interview with Assad. Watch "Good Morning America" Tuesday for more of Diane Sawyer's report from Syria. Sawyer: Your excellency, thank you so much for letting us come. 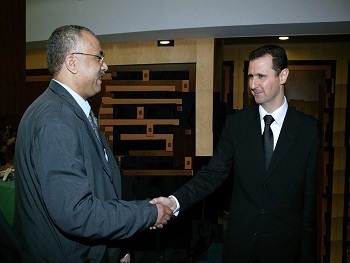 Assad: You're most welcome Miss Sawyer here. Sawyer: There are a chorus of voices in the United States saying that talking to Syria is the way to end the war in Iraq. Can you stop the violence in Iraq?